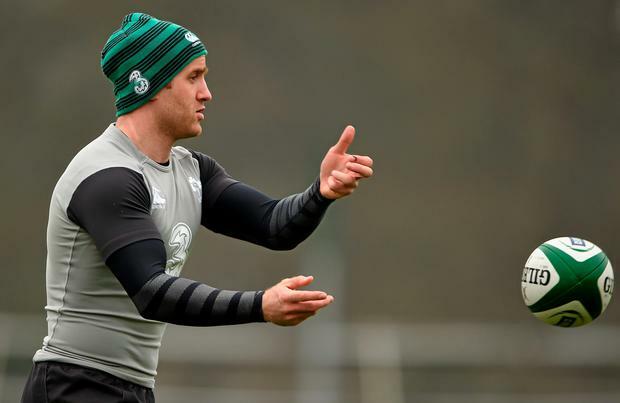 Joe Schmidt is set to make two changes to his Ireland team for their final Six Nations clash against Scotland on Saturday, with Luke Fitzgerald primed to win his first cap since November 2013. The Leinster winger has been part of the squad for the duration of the tournament but has yet to feature in a match-day squad. However, Simon Zebo's below-par display against Wales last weekend has opened the door for Fitzgerald's return. Cian Healy is ready to come back into the starting line-up in a straight swap for his provincial colleague Jack McGrath in a bid to freshen up the front-row for the final push to retain the title Ireland won in Paris last year. Zebo has started the last nine Ireland games since winning his first cap under Schmidt in Argentina last June but misses out after failing to impress in the defeat to Wales last weekend. It remains to be seen if the Munster wing will drop to the bench or if Felix Jones retains the No 23 jersey. Otherwise, the coach is set to stick to his guns despite last weekend's disappointment, keeping faith in Rory Best and Devin Toner despite Sean Cronin and Iain Henderson's performances off the bench in Cardiff. In the event they come out on top of the four-way final-day battle for the title, Ireland could lift the Six Nations trophy in front of an empty stadium on Saturday. Organisers will have the real trophy at Twickenham, where leaders England play France in the day's final game. A replica will be in Murrayfield in the event Ireland claim the championship and, if Schmidt's side prevail, they will be presented with that trophy on a stage on the pitch in their suits two hours after their game concludes. Possible Ireland team to face Scotland: R Kearney; T Bowe, J Payne, R Henshaw, L Fitzgerald; J Sexton, C Murray; C Healy, R Best, M Ross; D Toner, P O'Connell; P O'Mahony, S O'Brien, J Heaslip.